Australia has become a hotbed for wildly popular Metal bands and musicians. 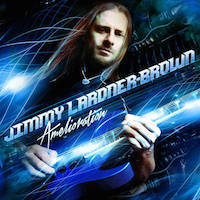 Hailing from Sydney, Jimmy Lardner-Brown is a standout on that list with his brand of trance-inducing Shred Metal. His debut album "Amelioration" is the culmination of nine tracks of string-ripping insanity, no vocals required. The guitar music he plays speaks for itself! Having been released on April 29th, 2015, "Amelioration" has already caused quite a stir. It is a mix of musical and instrument styles and one can almost feel the talent floating off of the guitarist's fingertips. I hope he has his hands insured! The title track for "Amelioration" opens up with a punch to the gut with a blistering tapping riff, crescendo to a heavy Rock riff that backs up the crazy solo that flows over the length of the song. There are a few slower, melodic parts that change up the feel and keep the listener guessing. It is amazing to think that someone could be so good, and that is only the first track! "Ripples" is a much softer track, more in the way of a Rock ballad. There are a few times that I was reminded of something Slash might play in a GUNS N' ROSES song. The music is absolutely enchanting and in parts sad, but never loses that awesome Rock feel. "Desolate" gets right back to the Metal though, and the variety of different chord progressions and riffs help designate this song as one of my favorites on the album. It is set at a much faster tempo and the energy never subsides! "Song For…" has an obvious Eighties feel to it. The opening tempo is almost Rockabilly, but goes to a slower, more ballad-esque rhythm. Some of the tapping on this track reminds me a little of Herman Li of DRAGONFORCE. It is a stretch of a comparison but not out of the realm of reason. "Waltz" is a guitar rendition of Chopin's classical masterpiece, and is well executed. A very impressive and appropriate piece to include in an instrumental album, it shows the connection between classical composers of centuries past and modern Rock and Metal music. "Initiation… Addiction" is a heavy-hitting track that seems to express the emotional rollercoaster that the concepts mentioned in the title can become. It is a wild ride rollercoasters often are, with the highs and lows going from one extreme to another in seemingly no time at all. "Silence Your Insolence" almost has a circus tone to it with the flurrying arpeggios coming swiftly, almost in the tone of a boss telling someone to do exactly what the title requires! "Shining Brightly" has a very mellow overtone and sets a more somber mood than the other songs, almost in love song fashion or perhaps as a tribute song. This one, more so than the others, would be well suited for some vocals without detracting from the amazing guitar playing. It is also the second-longest song on the track, missing the top length by a mere second. "Pink Monkeys" is a more festive song, with a strong Rock and Roll rhythm to it, I could see the dance floor full of moving bodies with this one! There is a nice breakbeat in the background accompanied by a riff that could get some airplay since that style has a lot of appeal to radio markets in many places. There's even some Jazz guitar near the end of the song, just for some added flair! The listenability of this album is incredible and the value cannot be overstated! Jimmy Lardner-Brown's Metal band KILLRAZER is no doubt the launch point for his success as a solo artist, and rightfully so, having earned the distinction of winning two national "Best Guitarist" competitions. So props to him, and get ready to get your Shred on, courtesy of "Amelioration"!